Guy McLimore is one of the Original Gangstas of tabletop roleplaying, with his first professional credit being an article in Dragon Magazine #6 in 1977. He bought hot dogs from a kid named Ernie Gygax at Gen Con IX, and once lost the only 20-sided die in southern Indiana irretrievably down the unfinished wall in a friend's attic game room and had to draw chits from a cup to keep playing for two weeks until a replacement set came from the Dungeon Hobby Shop in Lake Geneva. McLimore was an early fan of Steve Jackson's Ogre and The Fantasy Trip, and wrote TFT MicroQuest #3: GrailQuest, which Metagaming published in 1980. Soon after that came the split between Jackson and Metagaming, and McLimore — with exactly one professional design credit to his name — got the task of trying to follow Steve Jackson as Line Editor for The Fantasy Trip. He held that position until Metagaming folded its tent in early 1983. Just before Metagaming wrapped up operations, Guy and his partners Greg Poehlein and David Tepool, under the name Fantasimulations Associates, were recruited by FASA as the primary design and development team for their Star Trek: the Role Playing Game. The trio wrote/designed/edited much of the ST:RPG line (as well as material for FASA's other licensed system, the Doctor Who Role Playing Game) until they parted company with FASA in 1987. Along with frequent co-author Greg Poehlein, McLimore worked on a number of designs in the late '80s and early '90s, including RPGA tournament adventures for Gen Con and other venues, the satirical Castle Greyhawk adventure module for TSR in 1988, and Mekton Empire for R. Talsorian in 1990. In 2001, McLimore, Poehlein, and artist Gary Williams founded Microtactix Games, one of the first all-PDF print-and-play game publishing firms. Under Microtactix, Poehlein and McLimore developed and released Simply Roleplaying!, designed as a multi-genre RPG system that meshed with its own board-based combat game (Compact Combat) and miniatures rules (the Origins Award-nominated Budget Battlefield) as a fully-integrated board/minis/RPG trio called the PlainLabel Game System. 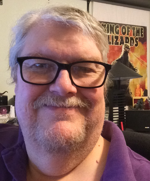 McLimore semi-retired from the gaming industry in 2005 but has remained active as a fan and frequent Kickstarter supporter of roleplaying and boardgaming of all sorts. He counts as his proudest moment in the hobby having John Kovalic name the hapless hero of Dork Tower "Matt McLimore" in his honor. Now, McLimore — deliriously happy to see The Fantasy Trip back in the hands of its creator — is once again taking the reins of that much-loved game system as Line Editor, bringing what he still calls his "career" full circle. McLimore lives in southern Indiana with his beloved and patient wife of many years, Barbara, and Still Too Many Cats. He also has a bizarre tendency to write about himself in the third person. In all seriousness, I am incredibly happy to return to the hobby with SJ Games and The Fantasy Trip. Steve has built an amazing troupe of game-loving creators, and I feel quite honored to be working with people whose efforts have made me totally envious and magically entertained. I hope I'll hear from all of my fellow members of TFT First Fandom. But please, if you are playing TFT for the first time, I want to hear from you even more. The Fantasy Trip is a game with a history, but the best part of that history is yet to come. What TFT could have been was short-circuited years back. It's past time for that to change. I'm so proud to be part of it. To discuss The Fantasy Trip roleplaying game with Steve, Guy, and others, please join the conversation on the forums. For notification when The Fantasy Trip project launches, please follow Steve Jackson Games on Kickstarter.